The Ojai Pharmacy. Until the 1960s, the arcade was Ojai’s primary business district, catering to the everyday needs of local residents. 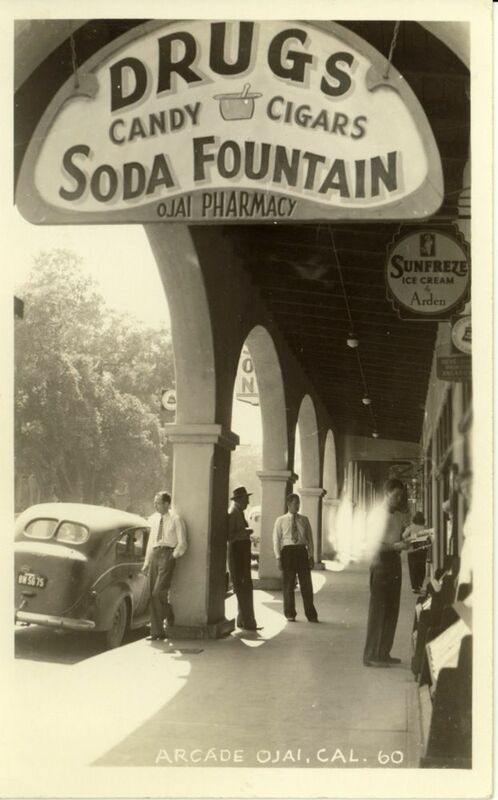 One such business was the Ojai Pharmacy. In addition to filling prescriptions, it featured a full soda fountain and lunch counter. Howard Nelson Rockafellow, a colorful Ojai personality, started the business in 1927. Over the next 30 years he helped organize the Ventura River Municipal Water District, served as President of the Lions Club and Chamber of Commerce, and sat on the City Council. Rockafellow single-handedly thwarted a move by the Ventura Chamber of Commerce to rename Lake Casitas “Lake Ventura”. Ironically, while giving an autobiographical speech to the Retired Men’s club at age 71, he ended with, “I expect to live the rest of my life in Ojai”–only to be struck dead by a heart attack at that very moment.